First, it doesn’t matter whether Brett Kavanaugh is on the Supreme Court or not; one more Deep State toad won’t make any difference. Second, the Supreme Court has been derelict in its duty for the last 80 years. For years, the Court has looked the other way as the feds robbed one class of citizen (ordinary, working people) and rewarded another (the elite). Third, as a result, the American empire faces a catastrophic money crisis… probably accompanied by internal schisms, social breakdowns, and dangerous political scuffles. Let’s begin by looking again at the connection between time and money. If you work by the hour, the guy with money can buy your time. That’s what it really means to say someone is “rich” – he has more time because he can control not only his own, but yours, too. The guy who had $1,000 worth of stocks in 1971 could buy approximately 250 of the average working man’s hours. Today, that $1,000 worth of stocks is worth about $28,000… which, at today’s $26-per-hour average, will buy 1,077 hours of the typical working man’s time – four times as much as in 1971. In other words, compared to the wage earner, the capitalist is four times as rich. Invert it, and you see about the same thing. A working man would have had to labor for 212 hours to buy the 30 Dow stocks in 1971. Today, his time is much less valuable; he has to sweat for over 1,100 hours to buy the Dow. That’s why the liberals whine about “inequality”… and probably why Donald J. Trump was elected. Few people may have done the math, but a lot of people suspected a rat. Many – including the president – pointed their fingers… but at the wrong rat! They thought it was the foreigners who had done them dirty: the Chinese with their “unfair trade practices” and the Mexicans “pouring across the border, stealing our jobs,” was the jingo. 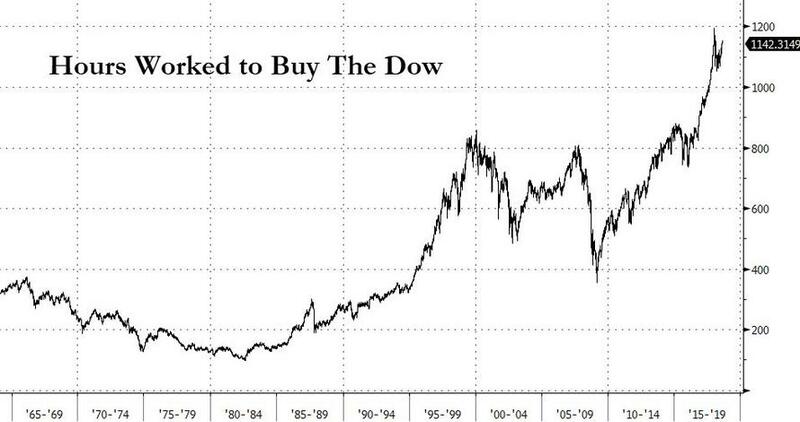 For their part, investors, the rich, and the cronies and insiders thought they were smart. They earned their wealth fair and square, they believed, by funding America’s enterprises… and by carefully allocating precious capital to worthy businesses run by able corporate champions. How exactly was the fix put in place? In 1933, the matter first came before the Supreme Court. 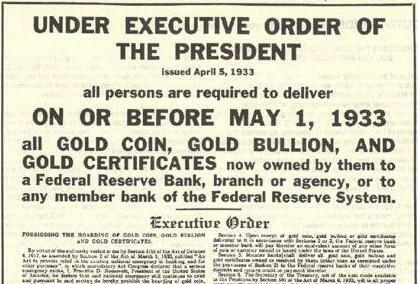 Franklin Roosevelt’s Executive Order 6102 made it illegal for citizens to own gold, except in the smallest of quantities. It came to the Supremes in a series of disputes called the “gold clause” cases. “Where in the Constitution did the president get that power?” people wondered. Back then, some investors recalled that the feds can play fast and loose with the dollar, as Lincoln had during the War Between the States. Gold clauses in contracts protected them by insisting on gold as a means of settling up. Eliminating the gold clause meant taking away the ability to protect against inflation... and substantially altering the terms of the deal. 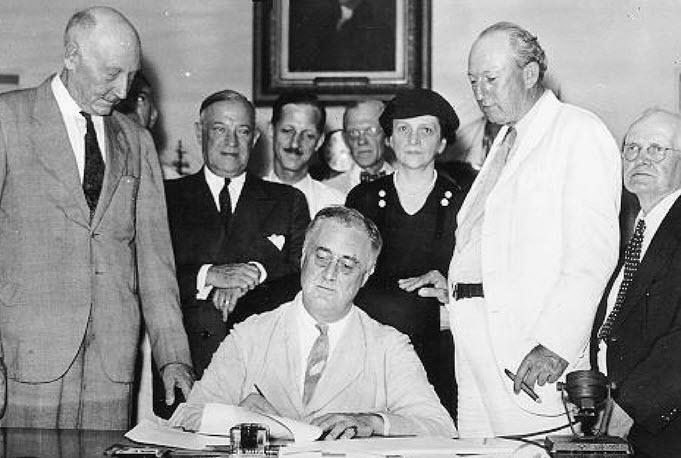 McReynolds went on to make the point that when you buy a bond or make a loan, “the creditor agrees to accept and the debtor undertakes to return the thing loaned or its equivalent.” Because Roosevelt’s Executive Order meant companies could be paid back in depreciated dollars instead of gold coin or gold equal to the value of the original loan, McReynolds recognized that this was a de facto default. With the gold clause out of the way, the coast was clear. The feds floated out one program after another, meddling in every aspect of human life. There was now a third party in almost every transaction – the federal regulator. By the 1950s, the fake wars had begun, too – major wars – with no declaration or funding from Congress. By the 1960s, the Johnson team had a full-scale war in Vietnam (a country with no capacity or intention to harm the U.S.). In addition, it launched a War on Poverty, too… intended to create a Great Society, where the lambs would lie down with the wolves and fruit would hang from every ghetto palm. But humiliation was afoot. It was soon clear that the feds were going to run out of money. And this time, it was the Nixon team that shirked its duty. Rather than admit that it had overspent, Nixon repudiated the last link with real money and the ability of foreign governments to exchange their dollars for gold at the promised rate. Now, the feds had gone Full Paper. Their money was nothing but pieces of paper backed by what was soon to be the world’s biggest debtor.